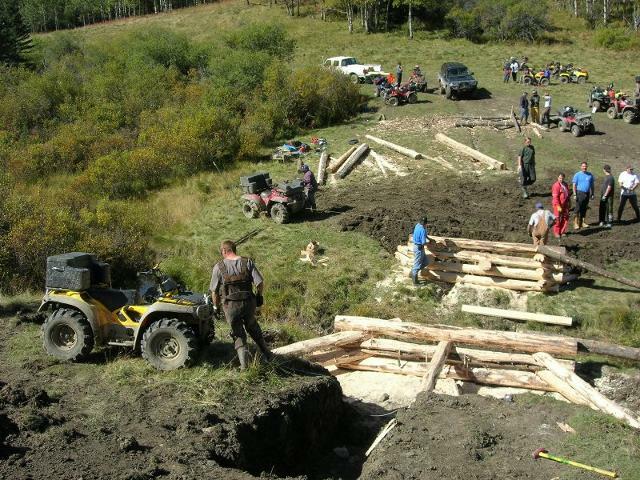 ATV bridge constructed by the ATVFrontier.com "REBELS" members. Back-fill yet to be completed. Actual construction time was about 6 hours plus site preparation and project planning. This bridge is located in the Ghost FLUZ on Lost Knife Trail near WP#77. The Bridge allows ATVs and other users to cross this creek without causing downstream water quality issues and bank erosion. These were some of the early days of the Calgary Rebels that spawned the creation of the Calgary Quad Squad (CQS) Association in 2006, and which was renamed to the Calgary ATV Riders Association (CARA) in 2009. 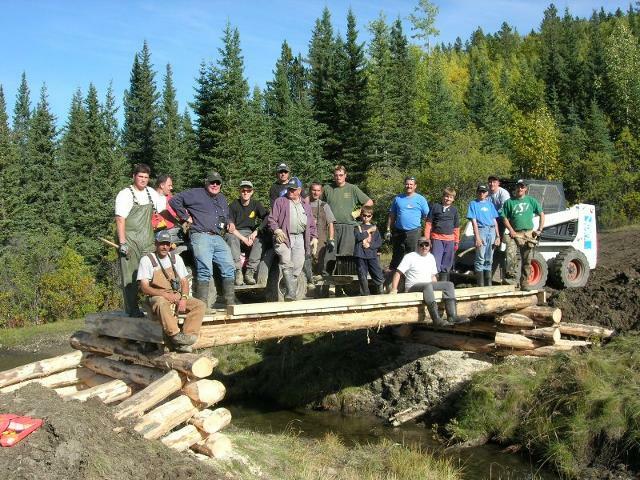 Left>Right: Terry E, Carson, (big dodge), Bob B, Robert W, Don M, Tony S, Jamie, Brendin P, David C, Todd L, Dillon C, Matt M, Garry S, Evan P.
Preparing the banks and stripping the bark off each log. 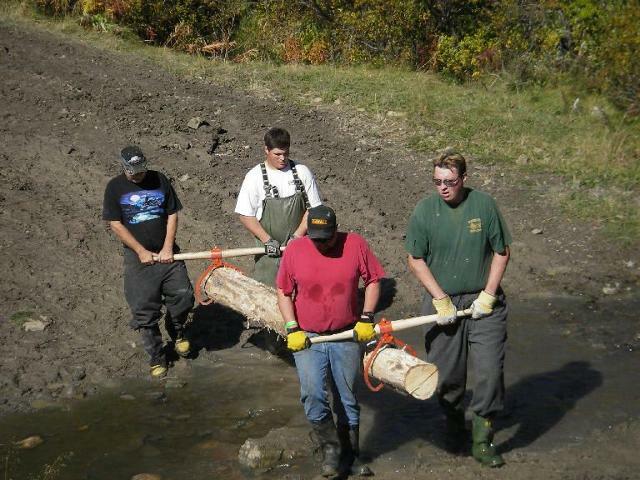 ATV winches were used to help pull large log "stringers" across the gap. You can see unstripped logs that were used to lift and direct the massive stringers from bank to bank. Re-bar was pounded thru the connecting points of each log to tie the entire structure together. Alberta SRD officers were on site to monitor construction, environmental and safety issues. Some of the big boys doing the heavy lifting of the log stringers for the bridge deck. Although the log look short it is over 20' long and very heavy. This is one of three logs that span the distance from bank to bank. The rough cut dimensional lumber bridge decking is attached to each of these logs using multiple long screws.